Safe For all cattle, even in pregnant cows. Broad Spectrum - Controls the 9 most damaging worms in cattle. Convenient Formulation - Easy handling formulation. 1 day feeding. Lungworms: (Dictyocaulus viviparus). Stomach worms: Barberpole worm (Haemonchus contortus), Brown Stomach worm (Ostertagia ostertagi), Small stomach worm (Trichostrongylus axei). Intestinal worms: Hookworm (Bunostomum phlebotomum), Thread-necked intestinal worm (Nematodirus helvetianus), Small intestinal worms (Cooperia punctata & C. oncophora), Bankrupt worm:(Trichostrongylus colubriformis), Nodular worm: (Oesophagostomum radiatum). Feeding Directions: Feed as sole ration for 1 day.No prior withdrawal of feed or water necessary.Feed at a rate of 5 lbs per 1,000 lbs of body weight to provide 2270 milligrams of Fenbendazole per 1,000 lbs of body weight. Under conditions of continued exposure to parasites, retreatment may be needed after 4-6 weeks. 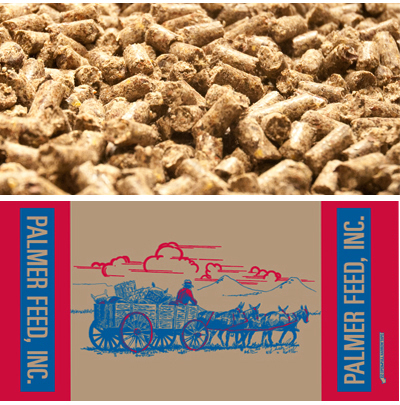 PALMER FEED & SUPPLY, INC.
PALMER’S PREMIUM ALFALFA PELLET 1/4"
Ingredients: Forage products, rice bran, cane molasses, calcium bentonite, vitamin A supplement, vitamin D3 supplement, vitamin E supplement. Feeding Directions:If replacing all hay in the diet, feed 1% to 2% of the animal’s total body weight per day.If being used to supplement hay, feed 4 to 6 lbs of cubes per day. Cubes can be soaked in warm water to soften for senior horses or for horses with dental problems or prone to choking. Can be used as a complete source of roughage and protein for most classes livestock and horses. Note: Because fiber consumption encourages drinking, always provide plenty of fresh, clean water at all times.Keep product fresh and store in a cool, dry place. Ingredients: Grain products, plant protein products, processed grain by-products, cane molasses, calcium bentonite, calcium carbonate, lignin sulfonate, dicalcium phosphate, monocalcium phosphate, vitamin A supplement, vitamin D3 supplement, vitamin E supplement, roughage products, mineral oil, propionic acid, acetic acid, benzoic acid, sorbic acid. Feeding directions: Feed 3-4 lbs per/head/day as a supplement to cattle on pasture. Feed 1-2 lbs per/head/day as a supplement to sheep on pasture. Ingredients: Grain products, plant protein products, forage products, cane molasses, calcium bentonite, lignin sulfonate, vitamin A supplement, vitamin D3 supplement, vitamin E supplement, roughage products, calcium carbonate, mineral oil, ferrous carbonate, zinc oxide, manganous oxide, copper oxide, calcium iodate, cobalt carbonate.. Feeding directions: Feed 3-4 lbs per/head/day as a supplement to cattle on pasture. Feed 1-2 lbs per/head/day as a supplement to sheep on pasture. Ingredients: Plant protein products, processed grain by-products, grain products, cane molasses, rice bran, calcium bentonite, lignin sulfonate, vitamin A supplement, vitamin D3 supplement, vitamin E supplement, roughage products, calcium carbonate, mineral oil, ferrous carbonate, zinc oxide, manganous oxide, copper oxide, calcium iodate, cobalt carbonate. Feeding directions: Feed 2-3 lbs per/head/day as a supplement to cattle on pasture. Feed 1/2-1 lbs per/head/day as a supplement to sheep on pasture. INGREDIENTS: Plant protein products, rice bran, cane molasses, vitamin A supplement, vitamin D3 supplement, vitamin E supplement, roughage products, calcium carbonate, mineral oil, ferrous carbonate, zinc oxide, manganous oxide, copper oxide, calcium iodate, cobalt carbonate. Feeding directions: Feed 1-2 lbs per/head/day as a supplement to cattle on pasture. Feed 1/2-1 lb per/head/day as a supplement to sheep on pasture. For a Calves: For the prevention of coccidiosis in ruminating and nonruminating calves, and cattle cause by EIMERIA BOVIS and EIMERIA ZUERNII. For Lambs: For the prevention of coccidiosis in lambs caused by EIMERIA BAKUENSIS and EIMERIA CRANDALLIS, EIMERIA OVINOIDALIS AND EIMERIA PARVA. Ingredients: Grain products, roughage products, forage products, plant protein products, cane molasses, calcium bentonite, calcium carbonate, ammonium chloride, urea formaldehyde condensation polymer (pelleting aide), silica, decoquinate, corn meal, soybean oil, lecithin, silicon dioxide, vitamin A supplement, vitamin D3 supplement, vitamin E supplement, mineral oil. 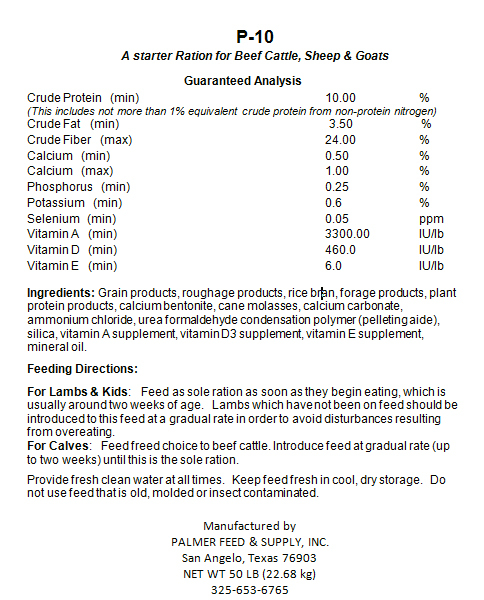 Feeding Directions: This ration contains 13.6 mg of Decoquinate per lb. Feed at a rate as indicated below to provide 22.7 mg decoquinate per 100 lbs of body weight. Warning: Do not feed to animals producing milk for human consumption. Do not feed to calves to be processed for veal. Ingredients: Grain products, roughage products, plant protein products, forage products, cane molasses, calcium carbonate, ammonium chloride, urea formaldehyde condensation polymer (pelleting aide), silica, soybean oil, lecithin, silicon dioxide vitamin A supplement, vitamin D3 supplement, vitamin E supplement, mineral oil. Feed for at least 28 days during periods of exposure to coccidiosis or when experience indicates it is likely to be a hazard. Warning: Do not feed to animals producing milk for human consumption. A withdrawal period has not been established for this product in pre-ruminating calves. Do not feed to calves to be processed for veal. Ingredients: Grain products, processed grain by-products, roughage products, forage products, cane molasses, calcium bentonite, calcium carbonate, salt, urea formaldehyde condensation polymer (pelleting aide), silica, vitamin A supplement, vitamin D3 supplement, vitamin E supplement,mineral oil, dicalcium phosphate, monocalcium phosphate, degummmed soybean oil. Feeding Directions: Feed to calves, cows, and bulls at a rate of .5 to 1.5% of body weight daily plus hay or pasture. Feed as sole ration for lambs and goats at the rate of 1.5 to 3 pounds per head per day. 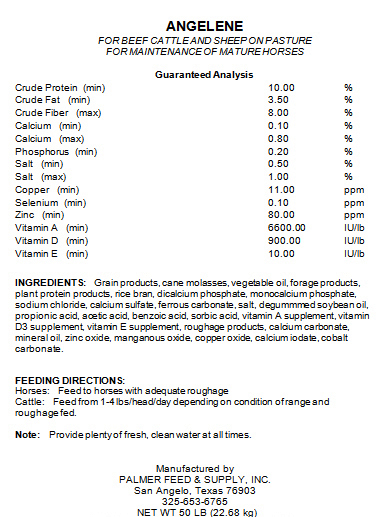 For horses, feed at a rate of .75 to 1.25 pounds per 100 pounds of body weight plus quality hay or pasture. Provide all animals fresh clean water at all times. Keep feed fresh in cool, dry storage. CATTLE: For removal and control of mature gastrointestinal nematoda infections including stomach worms (Haemonchus spp., Osteragia spp., Trichostrongylus spp.,) worms of thesmall intestine (Cooperia spp., Trichostrongylus spp., Nematodirus spp. ), and worms of the large intestine (Oesophagostomum radiatum). Ingredients: Grain products, forage products, roughage products, plant protein products, cane molasses, rice bran, ammonium chloride, menhaden fish meal, calcium bentonite, salt, calcium carbonate, morantel tartrate, urea formaldehyde condensation polymer (pelleting aide), silica, vitamin A supplement, vitamin D3 supplement, vitamin E supplement, mineral oil, dried streptococcus faecium fermentation product, dried lactobacillus acidophilus fermentation product, yeast culture (live saccharomyces cerevisiae grown on a media of ground yellow corn, diastatic malt and cane molasses), dried aspergillus niger fermentation extract, dried aspergillus oryzae fermentation extract, dried bacillus subtilis fermentation extract, beta glucan (encapsulating agent), ferrous carbonate, zinc oxide, manganous oxide, copper oxide, calcium iodate, cobalt carbonate. 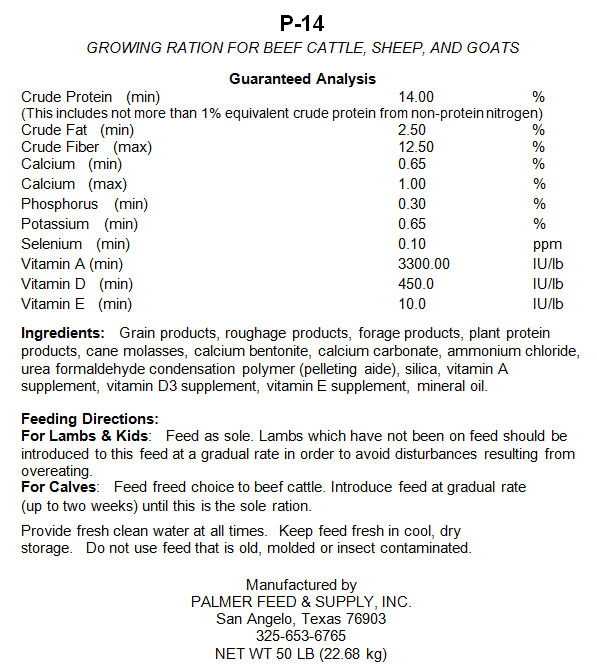 Feeding directions: For use in goats and cattle as a single therapeutic. Medicated feed is to be fed at a rate of 1 lb per 100 lbs of body weight to provide 0.44 grams of morantel tartrate per 100 lbs of body weight. The medicated feed should be consumed within 6 hours. Group animals according to size for optimal efficacy. Fresh water should be available at all times. Conditions of constant worm exposure may require retreatment within 2-4 weeks. Caution: Consult veterinarian before using on severely debilitated animals. A concentrated natural protein supplement fortified with vitamins and minerals. Developed for all species of livestock including cattle, sheep, goats, hogs, and horses. Provides nutrients needed for growth, reproduction, & performance. Promotes healthy hair coat and skin condition. 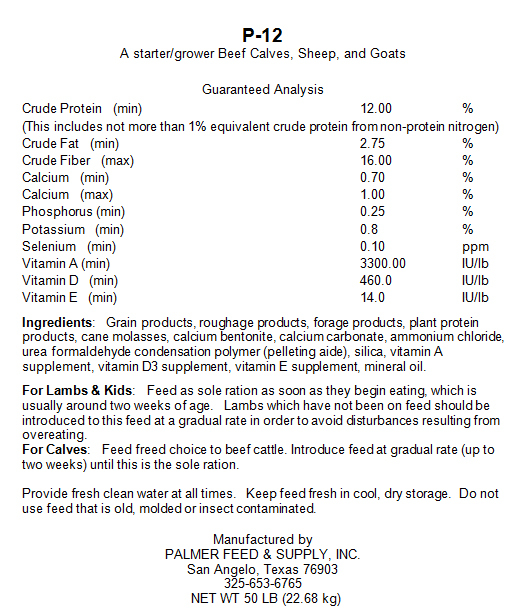 Increases feed utilization & intake. Improves hoof & overall condition. For Calves: For the prevention of coccidiosis in ruminating and nonruminating calves, and cattle cause by EIMERIA BOVIS and EIMERIA ZUERNII. Ingredients: Grain products, roughage products, plant protein products, forage products, calcium carbonate, dicalcium phosphate, monocalcium phosphate, sodium chloride, zinc sulfate, vitamin A supplement, selenium, red iron oxide, degummmed soybean oil, ethoxyquin (preservative), vitamin E supplement, mineral oil, linseed meal solvent, vitamin D3 supplement, dried streptococcus faecium fermentation product, dried lactobacillus acidophilus fermentation product, yeast culture (live saccharomyces cerevisiae grown on a media of ground yellow corn, diastatic malt and cane molasses), dried aspergillus niger fermentation extract, dried aspergillus oryzae fermentation extract, dried bacillus subtilis fermentation extract, beta glucan (encapsulating agent), manganese methionine, zinc methionine, corn gluten meal, cane molasses, distillers dried grains with solubles, menhaden fish meal, urea formaldehyde condensation polymer (pelleting aide), silica, flavor ingredients, butylated hydroxytolu, magnesium oxide, potassium chloride, vegetable oil refinery lipid (feed grade), lecithin, sulfuric acid, phosphoric acid, natural flavoring, artificial flavoring, propionic acid, sodium benzoate, ammonium chloride, manganese sulfate, dried whey, dried whey protein concentrate, dried skimmed milk, dried milk protein, soy flour, animal fat (preserved with ethoxyquin), vitamin A acetate, thiamine mononitrate, pyridoxine hydrochloride, folic acid, vitamin B12 supplement, choline chloride, calcium silicate, copper sulfate, cobalt sulfate, ethylenediamine dihydriodide, sodium selenite, calcium bentonite, butylated hydroxytolune (a preservative), decoquinate, corn meal, silicon dioxide. Feed for at least 28 days during periods of exposure to coccidiosis or when it is likely to be a hazard. Do not feed to goats producing milk for food.